Every day, breast cancer impacts many individuals from diverse backgrounds. But did you know breast cancer mortality rates differ depending on your ethnicity? Among African American women, breast cancer is the most prevalent form of cancer found, with lung cancer being the second most common cause of cancer deaths. Despite the fact that African American women are diagnosed with breast cancer less frequently than Caucasian women, the mortality rate is higher – but why? Often, breast cancer is found in African American women at a more advanced stage, when it is more difficult, or impossible, to treat. Maintain a healthy body weight. Obesity after menopause increases your chances of developing breast cancer. Reduce your alcohol intake. The more alcohol a woman consumes, the greater the risk of breast cancer. Breastfeeding. Women who breastfeed reduce their risk of breast cancer. Regular mammograms. The American Cancer Society recommends women over the age of 40 get annual mammograms. Susan G. Komen’s Circle of Promise is a resource and awareness program created specifically for African American women and men affected by breast cancer. We’re happy to have Dr. Portia Jackson, doctor of public health, recently join the Orange County Affiliate as the new strategy & implementation consultant for the Circle of Promise initiative. Q: How does it feel to be the first strategy and implementation consultant for Komen Orange County? A: I’m excited to engage and mobilize the African American community in Orange County to educate themselves and others about their breast health, to ultimately decrease breast cancer disparities among African American women. Q: How will the statewide Circle of Promise strategy unfold in Orange County? A: My goal in Orange County is to identify and serve diverse, underserved communities with high breast cancer mortality rates by providing community organization and direct education, as well as enabling screening and navigation services. We will address breast cancer disparities among African Americans who are rarely or never screened, low-income, uninsured or recipients of Medi-Cal. Q: Tell us about yourself. What did you do before joining Komen Orange County? A: I worked for the Center for Disease Control and Deloitte, as a consultant. On the side, I also work as a professor at UCLA focusing on the behavioral, economic, and biological underpinnings of racial and ethnic health disparities in the United States. I hold more than a decade of professional experience in the health industry. 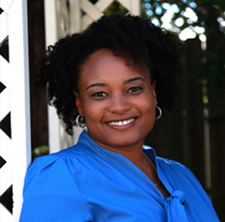 Please join us in giving a warm welcome to Dr. Portia! To learn more about the Circle of Promise initiative in Orange County visit: http://bit.ly/1gj7jxU or contact Dr. Portia Jackson at 714-957-9157 ext. 29.